My mom wanted a little lap quilt to keep her warm. So using the left-over fabric from her Chevron quilt I made her back in 2014, I made this little flower quilt for her. It measures 33' x 51". This is it BEFORE I washed it. Soooo after psyching myself out by looking on Pinterest and others blogs for quilting ideas, I finally just jumped in and first started by FMQ on and around the flowers. 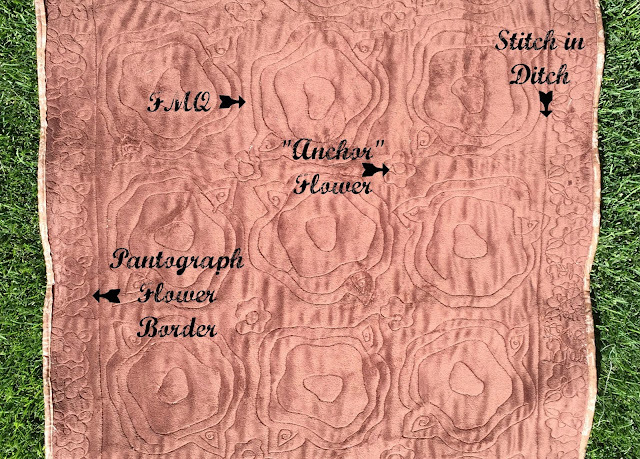 I then added a little "anchor" flower in the center where four corners of the flowers met. I also stitched in the ditch the entire perimeter of the quilt top. Then a had a flower border pantograph that was the perfect accent! I used this Soft &Comfy brown 100% polyester fabric for the backing. I was a little dissatisfied when I saw how "wiggly" it ended up. See that wiggle...ugh! But wait! Look at the difference once I washed this little quilt! The borders are all straightened up. 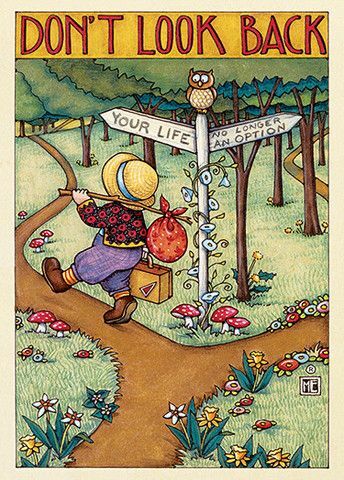 Wiggle gone. I've never used this kind of backing before, so I was careful not to pull it too tight on the frame and more than pleased to see how it tightened up after it was washed. I think the quilting was perfect...balanced and not too dense, which is what I wanted. Just look at those flowers with their little ravel started!! 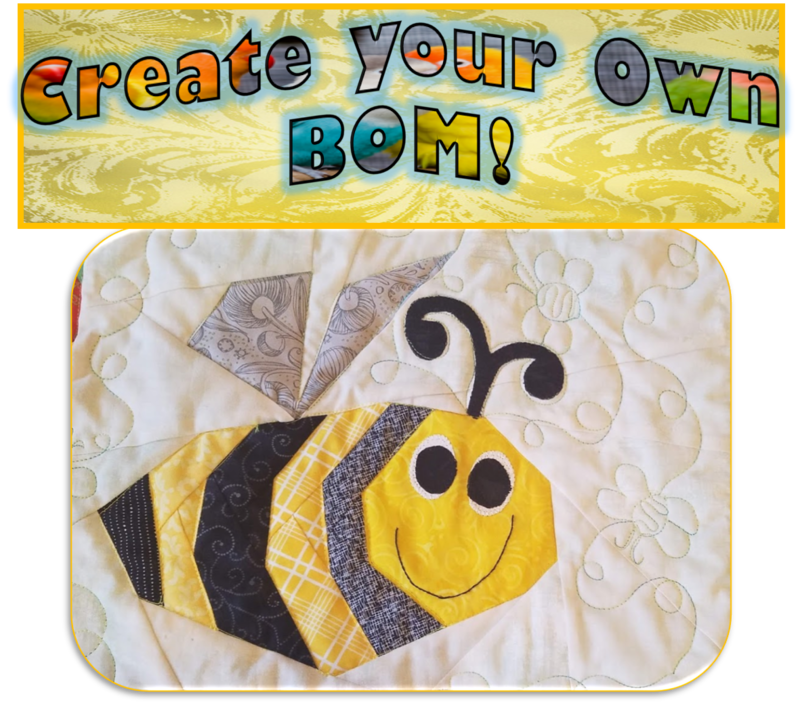 It makes me happy to know how much my mom will use this little quilt and inspires me to get back to sewing my queen size raw edged flower quilt I have started! Sometimes a little project in-between the big projects is kinda rejuvenating isn't it?! As always, thanks for stopping by and visiting. HEY! JOIN US for my Fourth Annual Piggy Bank Challenge. This looks really cool, Val, especially after washing. How do you control the fraying of the raw edges to prevent them from eventually unraveling into the seams? This would be fantastic texture to add to a baby quilt but I know those go through MANY wash cycles... Congrats on your finish; I know your mom will love it! Wow! What an eye opener regarding how "neat" the edge looks after a good washing. Amazing. I have a friend who makes one of these every year for a raffle quilt - money for breast cancer research in memory of her mom. Yes, the washing changes everything with this quilt pattern. With it's gorgeous Summer look, it sure is beautiful! Oh, now you have done it....again! Now I want to make one of those raw edge beauties! Yours turned out so nice. Thanks for sharing it with us. What a great quilt Val! Your little quilt is adorable! The picture of the quilt after it was washed is just stunning! Great colors and the flowers are beautiful! I have never tried a raw edge quilt due to my apprehension about the impact to the washing machine, dryer and the septic system. Am I overthinking this???? It looks great--I know your mom is going to love snuggling under it! I love the look of it after washing it. That will be a real treasure for her. It came out of the wash looking incredible. Great job. Your mum will love it. Such a lovely "quilty hug" for your mum. A beautiful finish! 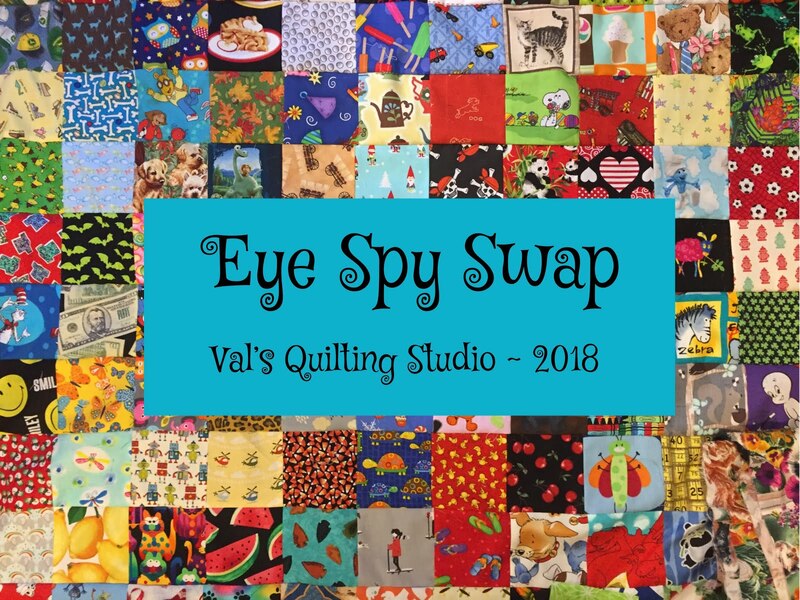 Such a fun and cheerful quilt Val! Your Mom must love it! Thanks for all the work you did for the I Spy Swap! I love the package you sent to me! Wow, Val; this is beautiful! Did you use stabiliser behind the flowers, or just the fabric as it comes? No stabilizer...just layered and sewed them together. That is a darling quilt. Looks like a perfect snuggling quilt. This is true that polyester tend to tighten when being wet. I'm glad to read that the washing resolved your problem and ended your disatisfaction. I know what it feels when you work hard on a piece and something out of your control changes the result. 😕 In the end, your mom's lap quilt is gorgeous (fabric choice, flower and quilting design). And, yes, I love the "writing". 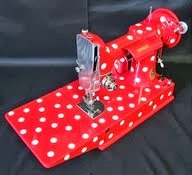 Oh, and thank you for participating to my Fabric, Thread and Yarn link party. I wish you a beautiful Sunday! 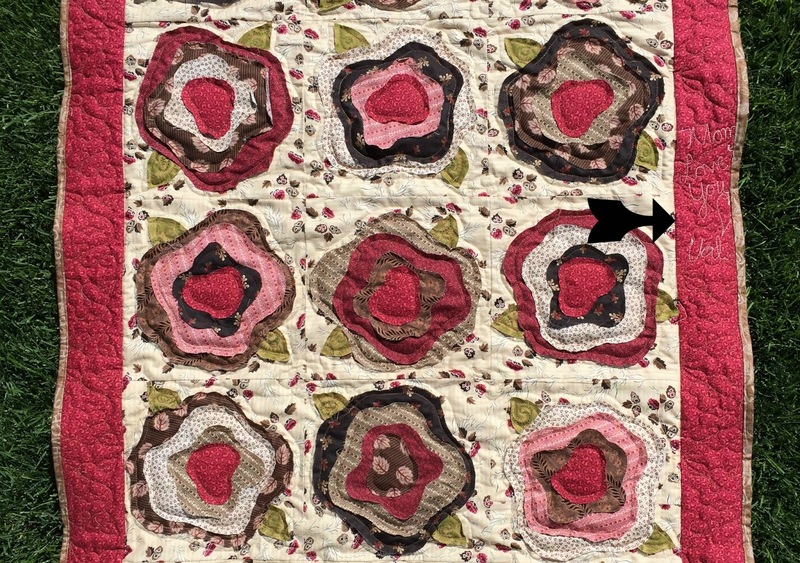 Was checking in to see the Archive topic for today and saw the link for this post --- love, love, love the French Roses quilt you made for your Mom!! The leftover fabrics from her Chevron quilt worked just as perfectly in this project. I've had that pattern for forever and really need to make it up. 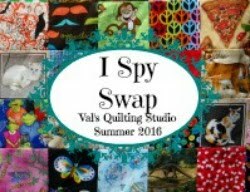 Your color scheme (chocolate covered cherries) is the same as a Valentines Day quilt I made so I see a companion quilt idea heading to the "To Do" list!! !